Order Ritchies Beer Starter Kit Lager from the Stirling Homebrew Shop UK. 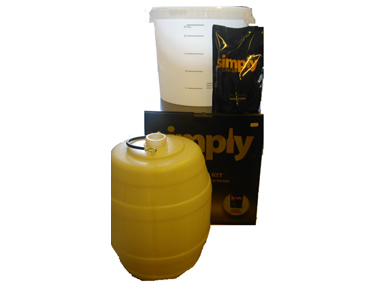 Buy Ritchies Deluxe Beer Starter Kit - Lager and other Homebrew Accessories safely online in the UK. This beer starter kit contains everything you need to make your own beer. Complete with fermentation bin and storage, pressure barrel. This beer starter kit contains everything you need to make your own lager. Comes complete with brewing sugar, lager beer kit and pressure barrel. Makes the perfect gift for the aspiring home brewer! All you need to add is water! Where to buy Ritchies Beer Starter Kit Lager safely online? Shop at the Stirling Homebrew Shop if you are wondering where you can buy Ritchies Deluxe Beer Starter Kit - Lager safely online in the United Kingdom. Beer Starter Kit Lager - Ritchies Deluxe Beer Starter Kit - Lager in Homebrew Accessories and Homebrew.